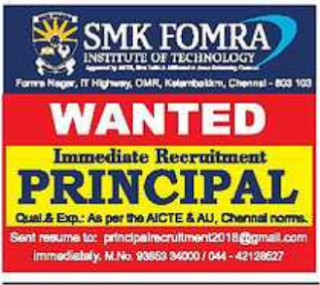 SMK FOMRA Institute of Technology, Chennai has advertised in the HINDU newspaper for recruitment of Principal jobs vacancies. Interested and eligible job aspirants are requested to apply immediately. Check out further more details below. Greetings to all. We, SMK Fomra Institute of Technology, welcomes you to this great institution. The Motilal Kanhaiyalal Fomra Charitable Trust was founded during the year 1995 by Late Shree Kanhaiyalalji Fomra, with a view to promote the cause of education and to help the economically and socially under privileged students. This is an ISO 9001:2008 certified institution.